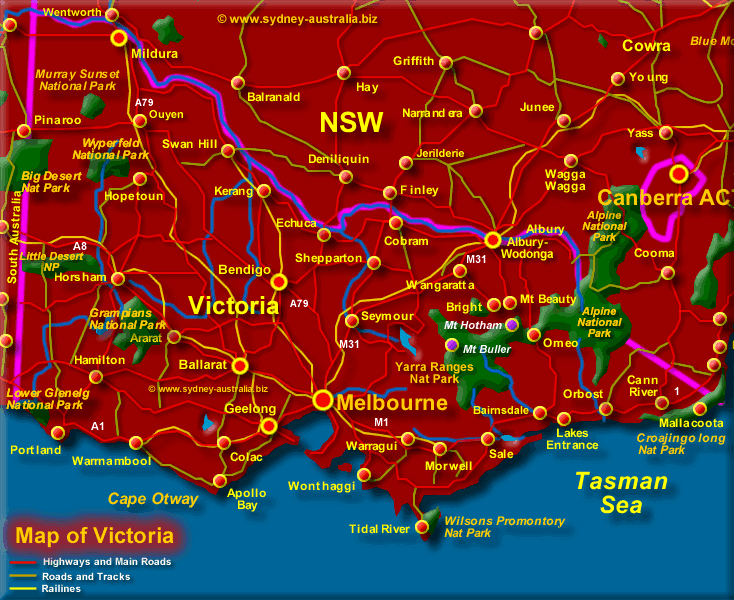 Tourist Map of Victoria - Towns and National Reserves and Parks. Also known as the Garden State, Victoria has a great sense of history. Melbourne and many of its towns such as Bendigo, Ballarat and Castlemaine boomed during the prolonged Gold Rush years. Taking care with many of their historic buildings and sites, there are many to explore from not only the colonial days, but the Victorian and Federation Periods. See more about Victoria Australia. The State of Victoria is bordered by New South Wales NSW to the north, with South Australia SA on the west. The Southern Ocean and the Tasman Sea border the south and east, respectively. In the East of Victoria, with its cooler climate, you can find wonderful wineries and the Alpine National Park, a winter snow playground during the colder part of the year. There is plenty of great ski-ing and winter sports, and spectacular mountain scenery during the rest of the year. Next Picture: Melbourne Victoria Map - Melbourne Victoria Map. To the West, there is the Great Ocean Road to explore, with the famed Twelve Apostles and stunning coastal scenery on the way to Adelaide in South Australia. Also in West Victoria, The Grampians National Park also has some unusual natural features, plenty of wildlife and unique flora, not found anywhere else in the world. See the Victoria National Parks Map. See the Victoria Places to Visit links below to find out more about these and other Victoria regions. See more about Victoria Australia. Melbourne Victoria is a treat for those looking for culture, great Australian wines, fine dining restaurants and home of the Australian Ballet. See Map of Melbourne City. Map of the south coast of Victoria Great Ocean Road Map.